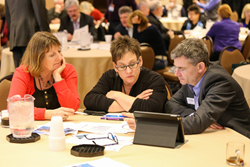 Nearly 400 TTI Success Insights (TTI SI) network members gathered Jan. 8-10 to learn about new products, honor top performers, and gather new ideas and strategies for business during TTISICon, the company’s annual conference, in Scottsdale. It encourages me to know the fresh energy and ideas shared by our network members will carry over and help them reach new heights in business in 2016 and beyond. The TTISICon theme, “The Business of Changing Lives,” set the tone for two days, packed with keynotes, TED-style Talks, and tactical breakout sessions and profit-center workshops, all to educate TTI SI network members about up-and-coming trends in talent management, new products and application. Conference keynoter Richard Pimentel delivered an emotional and inspiring talk on his life story as a disabled Vietnam War veteran and how through his activism he’s changed mindsets and brought greater self-awareness amongst corporate executives about the value the disabled can provide in the workplace. TTISICon brings together coaches, consultants and trainers from around the world who are affiliated with TTI SI and specialize in consulting, training, recruiting, coaching and speaking. This year, the mega event sold out for the first time in several years and returned to the heart of Scottsdale after taking place the past two years in neighboring Fountain Hills. Highlights from conference events were live tweeted using #TTISICon and posted on the conference website, TTISICon.com. TTISICon 2017, taking place Jan. 13-15, 2017, will return to The Scottsdale Plaza Resort in the heart of Scottsdale. TTI Success Insights believes all people are unique and have talents and skills of which they are often unaware. We exist to reveal and harness these talents, using the Science of Self™. For over 30 years, we have researched and applied social and brain science, creating assessment solutions consultants in 90 countries and 40 languages used to hire, develop and retain the best talent in the world. With a tenacious, innovative culture, we transform potential to productivity, performance and profits. Every 7 seconds, someone is taking a TTI SI assessment report to increase their self-awareness and grow their career. For more information, visit http://www.ttisi.com and @TTI_SI.